I'm in deep-clean mode right now, which led me to peruse the aisle of cleaning products at the store. I found a cute little bottle of granite cleaner and was shocked when I looked at the price: $5.99. Seriously? Six dollars for one small bottle of cleaner? As I mulled this over, I realized what has happened. Many of us have bought new houses with granite countertops or remodeled kitchens and installed granite countertops, so we're acutely aware that granite countertops are expensive. That is true. But we've gotten a little mixed up and assumed that, because they're expensive, they are also precious. And that is not true. Granite countertops are not precious. They do not have to be treated with kid gloves. After all, granite is the substance from which many tombstones are made. Ever visited an old cemetery? If so, you've likely seen pieces of granite which have been exposed to all the forces of nature for hundreds of years, yet you can still see the intricate carvings on the surface. If granite can withstand all the forces of nature, I think it can withstand less-than-kid-glove cleaning techniques in our homes. 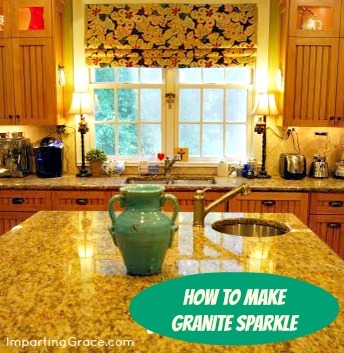 Want to make your granite countertops sparkle? That's easy. First, what NOT to do: don't chop food directly on the granite. Granite is sturdy but it certainly can chip. And hard stone is bad for your knives. Use a cutting board. When you're ready to clean your counters, wipe counters off with a damp cloth. I use my dishcloth and soapy dishwater for this. Any cloth will work, but microfiber cloths work particularly well for leaving fewer streaks. Now stand back and admire your sparkling countertops! Do you have any specialty cleaning tips? I'd love to hear them! 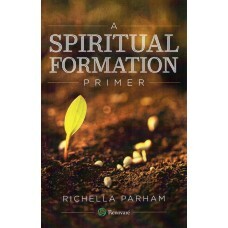 Would you like Imparting Grace delivered to your inbox? I scrub good with soap and water (dish cloth and soapy suds of the dish detergent) Then, after that dries, I spray a foam window cleaner on and buff it in with a dry microfiber cloth. Looks fantastic. I clean my granite and stainless steel and glass appliances, all in one wipe around the kitchen. Hi Richella, Thank you for this tip--I don't have granite but hope to in the future. When you mentioned gravestones though, I realized we always cleaned them with white vinegar. In fact, that is what I clean my wood floors with as well as counter tops-formica. I have heard the trick about furniture polish but haven't tried it yet. I've found that if they countertops aren't sealed well, they will be difficult to clean. I like the furniture polish idea. I'll give it a try. Thanks! What a great tip, Richella! I use furniture polish to shine mine; but it's a different brand. I'll have to try Pledge! I've used the furniture polish technique, but only in areas where food won't come in direct contact. Am I being paranoid about that? I do use furniture polish on my stainless appliances and it works great. Loving the furniture polish tip, thanks for sharing! We have tile countertops in our kitchen right now, and I so badly want to upgrade to granite! The tile is so hard to keep clean! For general clean-up I use Windex Multipurpose Vinegar. If I want them to truly shine I use Pledge Multipurpose. No fancy granite cleaner here! I always like to hear what other people do though! Wow excellent post.Thanks for sharing important post with us. Mix together in spray bottle. I use a wet microfiber cloth followed by a dry one for cleaning almost EVERYTHING in the house. It's great on windows & mirrors too, leaving no streaks. BUT, remember that you CAN NOT use fabric softener or dryer sheets when you launder microfiber, not sure why but it ruins them. I like a product called Weisman granite cleaner and polisher, I use a microfiber cloth with it. I get it at Wal-Mart and it works great. Consider NOT using anything citrus (acid) to clean granite - including vinegar! They will etch the surface over time. I've just gotten granite countertops in Indianapolis. They look good and they're durable. I clean a house with black granite tops - they are the worst in hiding finger prints, et. I used the Pledge and what a difference - they sparkle now! I do utilize furnishings polish on my small stainless devices and it really works excellent.